Showers and storms will be moving into the Bowling Green area into Monday morning and afternoon as a cold front sweeps across the southeast. Behind the front, we will see much colder temperatures which is change from the warm up we experienced this weekend. We see highs this Sunday as of 7:00 AM EST (6:00 AM CST) in and around 5-10 degrees above normal for this time in the month of November. 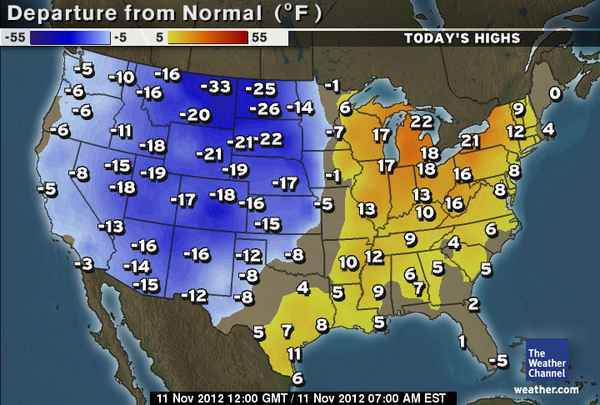 Photo courtesy of weather.com showing temperature departures from normal. As we examine the latest RUC model analysis of surface temperatures, you can clearly see the colder air mass in behind the front that will bring us the drop in temperatures for Monday and Tuesday. With the displacement of the surface low to the north west, we will see our chances of severe weather be cut down significantly. We do see a strengthened area of positive vorticity that will enhance upper level support into Monday. We also see pocket of elevated wind shear that will support lifting and provide a hail threat as upper level temperatures will be substantially cold. The main threats will be high winds and hail. The event will likely be in the nature of a squall line. Another inhibition will be the earlier in the day timing which will mean less daytime heating and energy for developing storms. After the cold front passage, We will see our winds shift from the south to out of the north west as the front progresses through the area bringing much colder drier air into the Bowling Green area. We are seeing winds increase throughout the day here in Bowling Green. 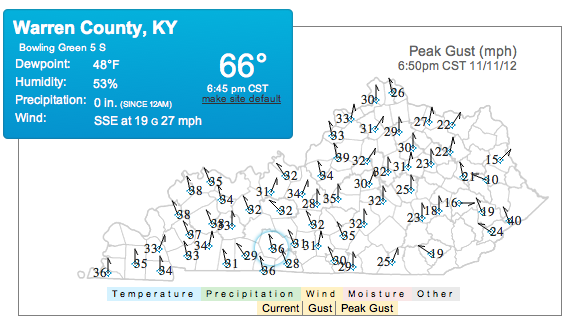 The Kentucky Mesonet shows peak wind gusts of up to 36 MPH in Warren County as of 6:50 CST. These winds are increasing in response to the tightening pressure gradient we are seeing across western Kentucky as the system is moving eastward. Looking into Tuesday, we will see a dry out with temperatures more normal to this time of year. Temperatures could drop below freezing Tuesday morning as that cold dry air continues to funnel in from the north west. Wednesday could also see below freezing temperatures in the morning hours and chilly temperatures remaining throughout the day. Wednesday our winds will shift to the north east as surface high pressure builds in behind the previous system. A weak upper level disturbance will move towards the area deepening somewhat as it approaches our area. We can expect some light showers to possibly develop with this system. 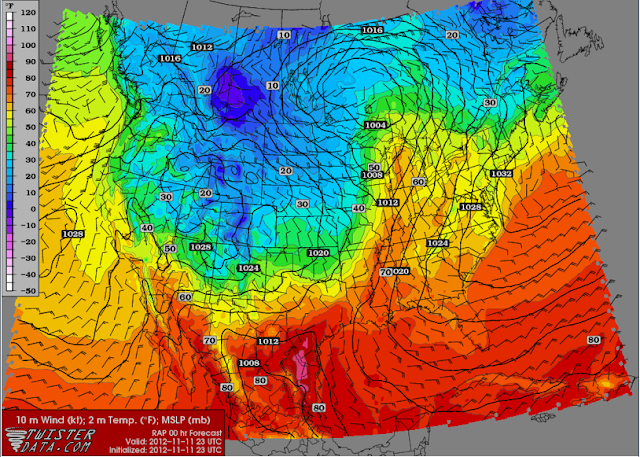 Forcing will be lacking for any severe weather/thunderstorm potential. Monday: High 48,. Low, 43. Winds SSE, 5-15 knots. Rainy cloudy conditions to persist throughout the day. Slight chance of strong to severe thunderstorms. Tuesday: High, 49. Low, 28. Winds NW, 5-10 knots. Clearing conditions with a cool down. Freezing temperatures possible in the morning hours. Wednesday: High, 51. Low, 26. Winds NE, 5-10 knots Light showers possible. Partly cloudy conditions.